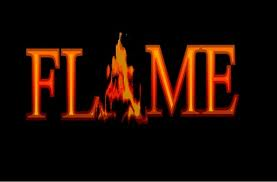 Need a forum logo for Flame. I observed that we are lagging behind in one thing that is a Clan forum logo. If you have any idea in you mind please paste it here. So that i will get some help for making one for us. Re: Need a forum logo for Flame. in a firey design and Some more fire in the sides but it should be 3D. 2D dose'nt look good. No it is not that much hard. First-We are not the Google and copy type. Second-This image is low resolution. Third-Raaj can make better stuff than this. Raaj is better at this stuff.